What’s the attitude of Kenyan men towards their women? What’s the attitude of Kenyan men towards women? Kenyan men are not as woman-friendly as European or North American men. In Kenya, it is said that men are regarded as the ‘first’ gender. While Kenyans are friendly and relaxed people on the whole, it is not unusual to hear “a womans place is the kitchen” type of arguments espoused by Kenyan men. This is even more the case with men who still live a traditional, tribal life style (which is only true of a minority of all Kenyans). The practice of female genital mutilation is decreasing but still quite widespread. The movie “The White Masai” tells the real life story of a white Swiss woman who married a Maasai warrior and moved with him to his village where she took on the tribal life style. The story didn’t end happily. Her husband felt threatened by her independence and became abusive. She had to flee with their child back to Switzerland. At the same time it’s true that Kenyan women are visible in society. They are not the types to sit quitly in a corner. They have sometimes pretty high-ranking jobs and some are active in politics, business and the media and entertainment sector. In mid 2007, eighteen of 222 members of the Kenyan parliament were women. 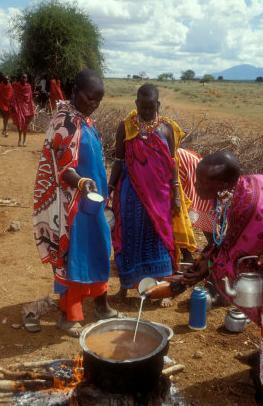 Older Kenyan women have traditionally an important role in tribal life, and command respect. Women are often the backbones of villages as they do the bulk of the farming work. But the December 2007 elections showed that some Kenyan men still have a problem with that. In the weeks before the election, no less than 255 cases of Kenyan men assaulting female political candidates were reported to the police, with no arrests following. Many received threatening or humiliating text messages. One female political candidate, Alice Onduto, was shot to death.